Description: New price reduction: price reduced $100k to reflect smaller lot (now 8.8 acres). Would consider trade. Owner willling to sell entire 25+ acres and guest home for $849,999. Realtors welcome! 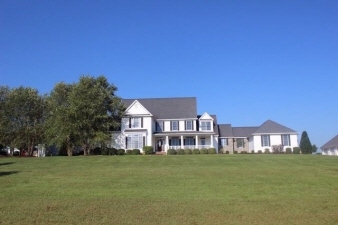 This beautiful southern style estate boasts gorgeous landscaping and pool, views of acres and acres of bluegrass farmland, and upscale finishes such as wolf & sub-zero appliances, hardwood floors, and a grand master bath with marble and heated flooring. The property has beautiful outdoor amenities such as gas fire pit, outdoor fireplace, outdoor kitchen, irrigation, and much more. In addition to the three car attached garage, there is a detached three car garage with a bonus room. Data believed correct but not guaranteed. Buyer to verify data prior to offer. Agents read agent remarks.